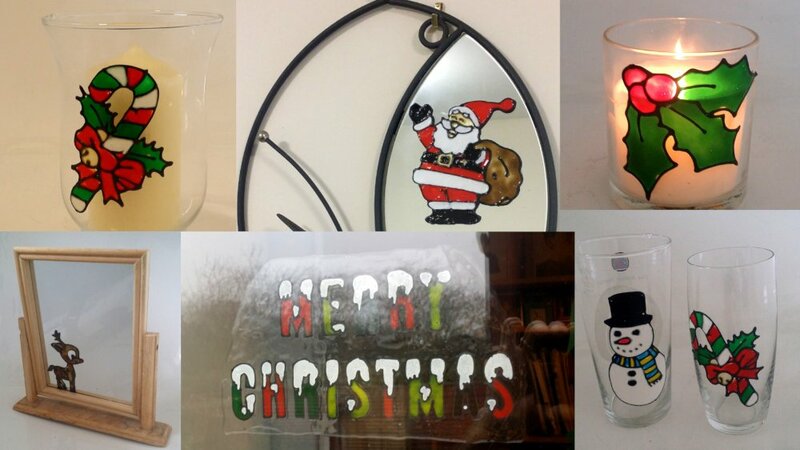 In this project we demonstrate making Christmas decorations with Peelable Glass paints. These are the thick waterbased glass paints. Many brands are available including: Plaid Gallery Glass, Pebeo Arti’stick, Berol Glass Paints, Glas Design Window Color and Stanger Window Color. In addition to these you will find a lot of generic brands available. Although the quality of these can be a bit hit and miss. Personally I really like the Gallery Glass paints but they are difficult to get hold of in the UK. There are several reason why making Christmas decorations with peelable glass paint is such a good idea. They can be stuck on any non-porous surface. 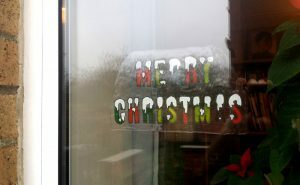 This means you can put them on glasses, mirrors, windows, some doors, candle holders, lamps and even the fridge! It is quite a simple project which is suitable for both adults and children. I would recommend that for very young children and adult should do the outlining first. Wait for that to dry and then let the children colour them in. At they end of Christmas they can be put back on the plastic sheet and stored away for next year. There is an endless supply of suitable designs on the internet. Makes a great activity to do with children or friends in the run up to Christmas. Place your design in a SMOOTH clear plastic wallet. Place a bit of cardboard behind the design to give it a bit of stiffness and tape it all together. This way the design won’t move around whilst you’re working on it. Outline your design(s) using a peeable outliner. (Most of the paint brands mentioned above make an outliner to go with them). Many of these outliners can be used straight from the bottle but I prefer to use a piping bag. Once outlined leave the designs to dry. When dry the piece can be painted. Again many of the paints can be used direct from the bottle. You should also ensure you have a paint brush standing by to help you fill in small areas. Ensure you get a thick layer of paint and that it gets right up to the outliner. Many people like to have a cocktail stick handy. This can be run through the paint to smooth it down a bit and also pop any air bubbles you get in the work. If you want to get a good finish then let each colour go tacky dry before you add the next. This might be a bit difficult if you are doing this project with young children. It will still be “OK” if you just plough on and do the lot but you may get a bit of bleed between the colours. Once painted you should leave it to dry. They normally needs to be at least 24 hours although I leave mine for 2 days before trying to do anything with them. It will depend on your room temperature. If you are new to this and a bit unsure just do a couple of test blotches of paint somewhere on the plastic. When you think it’s dry try peeling one of those off. The peelie should last for years if you treat it well. Always be careful when peeling it on or off a surface. Catch any small tears early and add a little paint over the top. If you have still got the same colour you can always use a bit of clear. 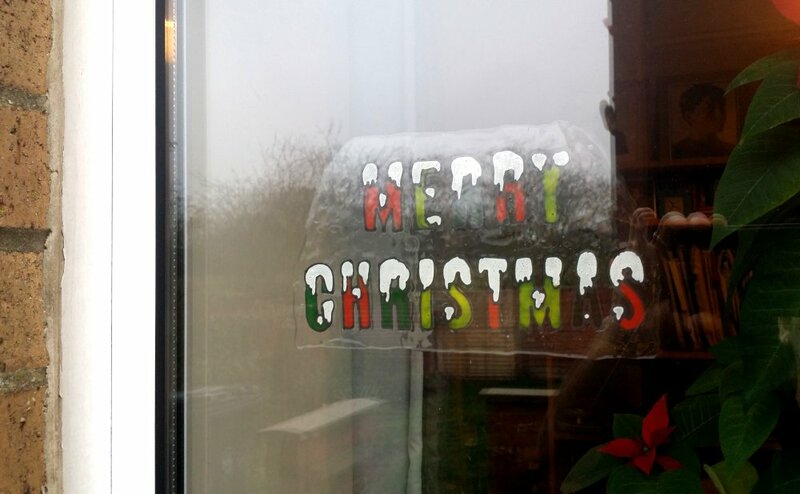 Put it away carefully at the end of Christmas storing it on the same sort of plastic sheet you first made it on. If if ever stops being sticky then just wipe down the back with a damp cloth. Some glass painters “look down” on the peelable glass paints, seeing as something mainly used by children. The reality is you can do some amazing work with them. The thickness of the paint means you can get many interesting effect which you can’t do when using flowing paints. This is especially true when you are blending to different colours in the same area. 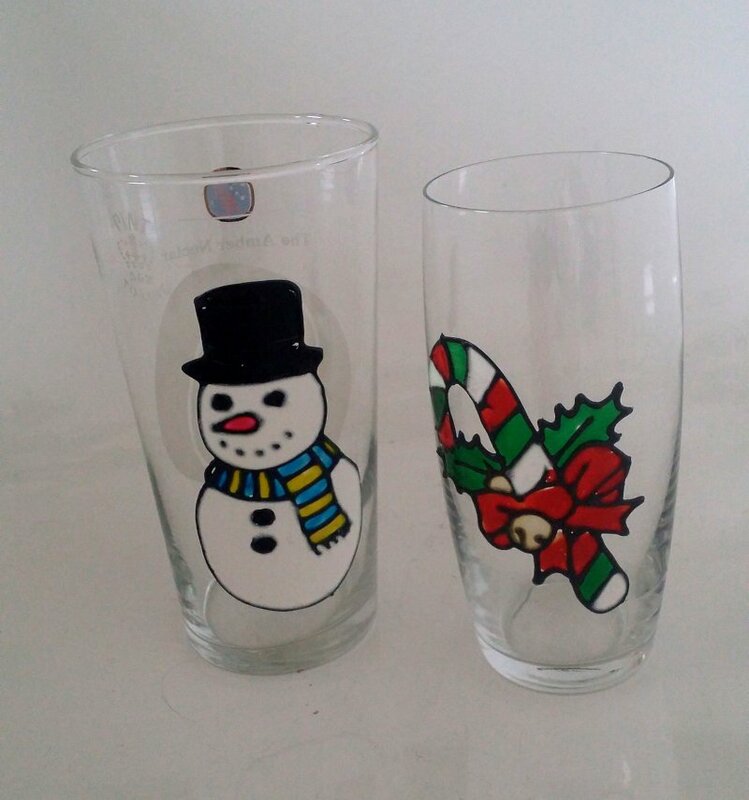 Having said that it is really a “fun” type of glass paint which every one can enjoy.